Edmund Stallwood was an active trade unionist and radical who worked as London correspondent for the Chartist Northern Star. This is his life story. 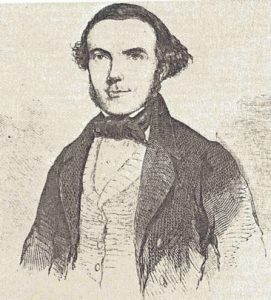 Best known as the London correspondent for Feargus O’Connor’s Northern Star from 1843-50, Edward Stallwood was politically active before and after the Chartist era, and spent more than a decade at the heart of Chartism. Born at Great Marlow in Buckinghamshire, the son of a labourer, he came to notice as a member of the committees of the National Union of the Working Classes and of the Grand National Consolidated Trades Union, where he formed the Lodge of Operative Gardeners. Stallwood married Mary Blackshaw at St James Church, Westminster, in 1831, and the couple had at least six children while living in Hammersmith and later Fulham. Stallwood was a London delegate to the Chartist Convention of 1842, and the following year succeeded Thomas Wheeler at the Northern Star. A supporter of the Chartist land plan, Stallwood was awarded two acres at Charterville in 1848, but does not appear to have taken them up. From the mid-1840s, he was also a member of the Fraternal Democrats established by George Julian Harney to build links with like-minded democrats elsewhere in Europe. This would later form the basis of the Chartist left wing, and influenced by Karl Marx would develop a socialist programme – “the Charter and something more”. Stallwood was one of the first subscribers to Harney’s Red Republican newspaper in 1850 and announced his departure from the Star in an advert placed there. He was sufficiently important within the Chartist movement at this point to feature as the subject of a portrait given away with Reynolds’s Political Instructor. In 1855, Stallwood left London for Gillingham in Kent, where he would spend the rest of his life. He remained active: acting as secretary to a committee looking into the necessity for and powers of a board of health, and speaking at meetings of the Liberal Party, the Board of Guardians and of dockyard workers. He died on 14 December 1866 at 9 Saxton Street, Gillingham. Based on information supplied by Pamela Hurley (nee Stallwood), the great great granddaughter of Edmund Stallwood.